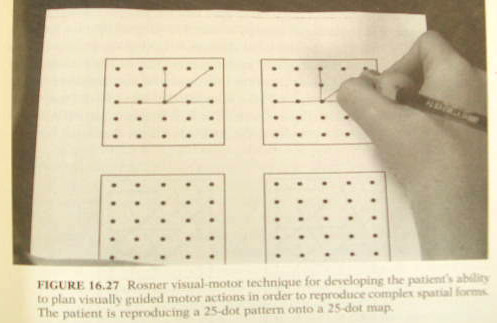 Rosner Forms/Dots are an effective and low-cost means of developing a number of visual and orthographic skills. The activities consist of replicating existing drawings onto grids of dots and have varying degrees of difficulty. These exercises are easy to tailor to a variety of ages, abilities, and needs. They are modifiable to reach any degree of complexity and difficulty, and lend themselves well to the strategy of ‘progressing successes’ (see ‘Approaching Therapy‘ and ‘Good Stress: Task Loading‘). You will find below all of the Rosner dot/pattern sheets for download. Use the Geoboard Patterns for copying. As always, do not rush through these exercises unless you are specifically directed to do so. Some of these exercises may require a Metronome. You could, for example, load a Rosner task by having the client do simple patterns with their non-dominant hand at a very slow tempo (<60 bpm), then accelerate the tempo progressively. You should never work the non-dominant hand more than 15-20% of the total time spent on the exercise in any given day.